In Chapter 1 we highlighted how tax advocacy relates to a range of economic and social justice issues: by providing revenue for essential services, redistribution to challenge poverty and inequality, representation to ensure accountability, and repricing to limit public ‘bads’ and encourage public ‘goods’. When doing government tax policy research, you may want to investigate the consistency of government polices, or the impact of government policies on selected groups of citizens: those living in poverty in a particular province, for example. This section will give you guidelines on doing both types of research, by looking at the tax burden on the poor on both a macro and a micro level. EXAMPLEWhy conduct research on government tax policy? In the Philippines, the Freedom from Debt Coalition highlighted that the International Monetary Fund (IMF) had imposed cuts in public spending in the Philippines and required the government to implement new taxes to deal with the fiscal deficit. Social movements wanted to campaign against this, but needed evidence that the changes would negatively impact on the poor. They conducted a household survey to show the minimum necessary income for a reasonable livelihood and the impact increased tax rates would have on the poor. In Chapter 2 we showed you how to use problem and solution trees to identify problems in relation to tax and economic justice and to come up with potential policy solutions. Research will help you test and refine the reasons behind the problem and inform your recommendations – what you will advocate for. There may be other causes not related to taxes, but the tax angle can bring a new element which will help advocacy efforts to look at the claims made by different stakeholders related to the problem. Are there other factors beyond tax which may be causing this problem? Can I separate the tax issue from other causes of the problem? Do I have enough time, resources and skills to answer this question? Is data available or will I need to collect it? The first stage in preparing your research involves building on the knowledge and experience of others. Have academics or civil society organisations (CSOs) looked at this research question before? Does that research need updating? Have others looked at the same problem in a different country or region? A literature review surveying the work that others have done will also help you refine your research questions. The methodology that you choose will be dependent on the kinds of questions you want to answer, and the data that you have available. Research methodologies are normally categorised as qualitative or quantitative. Qualitative research means that you deal with text and interviews, while quantitative research means dealing with numbers, statistics and issues that you can add up. For both qualitative and quantitative research there are various desk research methodologies, where the researcher analyses reports, academic literature and data, collected for example by the national statistical institute or international financial institutions. unstructured interviews – used in focus groups and during field observation where only a prior theme of the discussion serves as a guide. Finally, action research involves the researcher engaging with a given issue by participating for a limited period of time in the work of company operations or tax administrations on a negotiated basis. This may involve the researcher taking up an internship, or participating in advocacy activities as a researcher. Action research normally takes from three months up to a year. While economic research tends to be quantitative, the dynamics of social problems are always nuanced and will often require a qualitative approach as well. The trade-off is in how representative your research can be. When conducting quantitative surveys, you can cover a larger number of people in limited detail. When conducting qualitative research, it is likely that you will have richer and more nuanced findings, but that these will represent a smaller population. Bearing in mind the strengths and weaknesses of both approaches, there is a trend towards multidisciplinary research which seeks to use different approaches to answer a question from a range of different perspectives. Do you want to say something about a large sector of the population or a small number of people? Answer: The impact of tax policy on a whole sector of the population – You need to look at a quantitative statistical analysis. NO: Can you produce data? NO: Look at the local perspective. Answer: The impact of tax policy on a small group of people – You should choose qualitative analysis. Do you have access to the research sites? YES: Hire a field researcher, allocate resources and get going. YES: Map out the required time and resources. NO: You need to change topic or approach. Are you interested in the legal environment, or how the rules are applied? Answer: The legal environment – You need to hire a lawyer or accountant who can study the legislation. Is legislation or documentation available? YES: Study the extent of the documentation needed to study, allocate time and resources, and get going. NO: Has somebody made a secondary analysis of the documentation? YES: Assess whether the analysis is trustworthy – if yes, then get going. NO: Consider looking at the application of the rules instead. Answer: The application and abuse of rules – You need to consider a mix of desk and field research strategies, as you need to have a basic understanding of the rules that apply, in order to formulate good questions. Do you have access to the persons you want to interview? YES: Hire a good interviewer, brief them on the issues, and get going. NO: Seek approval from their superiors; try a different strategy, such as hiring an insider of the same profession or a past employee in the sector. Do you find a way to get qualitative data? YES: Then you have got over a hurdle – get going. NO: Maybe you won’t find data this time on this topic – try later as the ‘gate keepers’ may have changed, or change research topic. Are you interested in the causes of the problems, or knowing more about those affected by the malpractices? Answer: The root causes of the problems – Then look at the strategies above. Answer: The effects of malpractice on a local community – Try looking at studies of the affected communities to bring your issue onto the agenda. Can you find an affected community who can participate in the research? YES: When you identify a community or communities, explain your research to them, and start planning a policy impact or opinion study. NO: Sometimes communities don’t trust researchers – can you find a trustworthy party to participate in the research? YES: Work with your new research partner,and get going. NO: Seek another community or topic to research. There may be good reasons for a refusal – never coerce anyone to take part in your study. Policy-makers? Consider using statistically valid arguments and large samples for surveys so that the findings are considered credible and representative. Media? Consider producing headline-grabbing figures or case studies, or include good quotes that the media can pick up in their own reporting. Citizens? Consider which stakeholder group you want to influence and the arguments that they will respond to. Whether conducting research in-house or employing a research consultant, it is good practice to agree terms of reference. Research usually requires input and feedback from different people with different skills. Terms of reference will ensure that everyone is agreed on the scope of the research before work begins. The process of developing terms of reference will also help you confirm the feasibility of the research. Do you have the resources necessary? Is the relevant data available? Will it fit into your advocacy cycle? Are there legal risks or risks to personal safety that you need to be aware of? An example terms of reference is included in Appendix 1. If you lack the capacity for research within your organisation, discuss the options of hiring a research consultant or forming a partnership with an organisation that is already carrying out similar research and has the relevant capacity in-house.<This approach has benefits and weaknesses. Research consultants can be expensive and take time to manage. Working with staff is usually a cheaper option that allows for longer research cycles and enables learning to be kept inside the organisation. Consultants with particular expertise can, however, be hired to facilitate the research process and can help overcome particularly challenging phases of the research. Choose your research partners with consideration to both their experience and their affiliation. If the researcher is affiliated to a reputable institute, they may bring some of the experience and credibility of that institute to your advocacy. Your role as research coordinator involves managing the process from start to finish, supporting the consultant with additional data queries, facilitating access and logistics, and so on. In order to advocate for a more just and pro-poor tax regime, you need to know what your current regime looks like. The first step is to establish a baseline which can be updated as new figures become available or there are changes or amendments to the existing legislation. How does the government set tax policies and collect tax? Who is responsible for the design of tax policies, assessments and collection? Understanding the government set-up for revenue management and tax collection will help determine where to look for information on the country’s tax system. This will also help you with power mapping described in Chapter 2.
a specialised agency, with the ministry of finance, or may be spread across several agencies. Is personal income tax regressive, proportional or progressive? What is the corporate/company tax rate? What is the level of VAT? Are there any exemptions for basic necessities, addressing equity concerns? Is the system manageable or too difficult to implement? The official website for the government of Namibia (www.grnnet.gov.na/grnabout.html), which provides information about the different ministries (under the central government link, to the left of the page), shows that there is no separate tax authority. The website for the ministry of finance (www.mof.gov.na) has additional information, for example an ‘organogram’ showing that there is a revenue management department within the ministry, with subsections such as the directorates for inland revenue, customs and excise, and legislation and tax policy. What is the legal framework for the taxes to be collected? Understanding the legal framework of the tax regime is an important starting point in understanding the changes that you may need to advocate for. Often the ministry of finance or the national tax authority will have legislative information. World Bank and IMF documents do not always specifically analyse a country’s tax regime but may have useful background information. The ministry of finance website has a page with information on legislation. However, most of the acts mentioned, such as the act on income tax and VAT, are listed as ‘available soon’. Government websites do not provide access to all the relevant material or are not updated on a regular basis.In the particular case of Namibia, the solution was simply to do an internet search on tax legislation. On the World Bank’s country pages (go to www.worldbank.org, click on countries, select Namibia and then click on publications and reports), a list of all documents and reports can be opened. Documents such as the interim strategy note and the country brief have short sections on the tax regime. The IMF likewise has a country page for Namibia (www.imf.org/external/country/NAM/index.htm). The most relevant documents are the Article IV consultation staff reports that describe economic developments. Taxes on income, profits and capital gains are generally divided between taxes payable by individuals and corporations. They are called direct taxes because the person or business who owes the tax is directly responsible for paying it to the government. Legislation on personal income taxes will often include rates of income tax at different income levels (see the example from Namibia below). This is the easiest and most telling part of the legislation as it enables you to understand how much a person can earn before tax (which is often important for low-income households). particular how high the highest tax level is and at which income level it kicks in. At the time of writing, the N$/US$ exchange rate was 7.65, which means that the standard exemption in the Namibian case is equivalent to US$3,137 (€2,553). The highest income level used in the Namibian case is equivalent to US$26,144 (€21,276). Income tax legislation should also contain information on the corporate tax rates. Some countries apply different tax rates to different sectors within the economy in order to incentivise specific industry sectors or promote employment and export or replace imports. Some companies enjoy extensive tax breaks which may be implemented to attract them to the country. Are countries engaged in tax competition? It makes sense to look at the corporate tax rates of other countries in the region and at collaboration to avoid a ‘race towards the bottom’ where countries try to attract companies on the basis on tax breaks. In addition to direct taxes, most countries apply consumption taxes such as VAT, general sales taxes, and excise taxes (which are usually imposed on a limited range of goods, such as luxury goods or on products that can have a harmful impact on the consumer). These are important to identify, because they tend to be regressive and impose a heavier burden on the poor than on the well-off. The legal framework should clearly establish, among other things, the rate of VAT, products that might be zero-rated and a list of all items that are exempt from VAT – this information will help determine whether the tax imposes too heavy a burden on the poor because of its regressivity. If the government has included a list of exempt items, this can be compared to the basic necessities of a standard household. Trade taxes are usually made up of customs duties, tariffs and export taxes. This can be a quite complex area to investigate as it is closely related to trade policies, including those determined through bilateral and regional trade agreements. Some countries publish information about duties on imported goods (see, for example, www.nra.gov.sl), but this needs to be analysed in the context of potential free trade agreements and customs unions (bilateral and regional). It is important, however, to keep in mind that not all government revenue derives from taxes. Total government revenue is not the same as tax revenue. Government revenue includes social contributions, grants, property and rental income, dividends from state-owned corporations, and sales of goods and services. Royalties from extractive industries also belong in this category as they arise from a rent of the right to use land for a limited period of time. What are the actual revenues and who pays? After analysing the legal framework, the next step is to look at the actual revenue streams from the different types of taxes. This will add perspective to the previous part of the analysis and will perhaps highlight areas that need to be investigated more closely. The best place to look for actual revenues from the different taxes is in the budget execution reports, because they reveal actual and often audited figures. Budget reports are interesting too, but they have limitations in that they are based on estimations and projections. The example below explains how this analysis can be completed. With this data collected, analysis can be conducted in a number of different ways emphasising different aspects of the tax situation. It is important to consider carefully how to present your data depending on the message you are delivering. 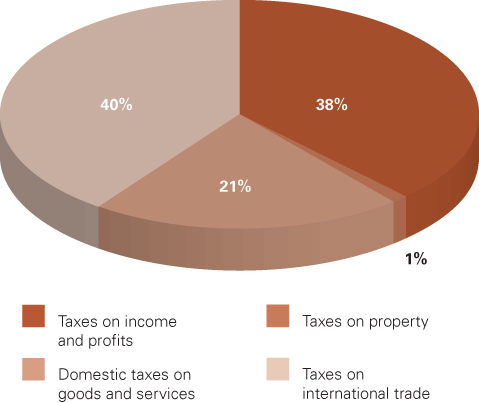 Figure 1 shows the proportion of revenue that each tax source contributes. This is sometimes referred to as the ‘tax mix’ and demonstrates how dependent the country is on different sources of taxes, or which sectors bear the heaviest tax burden. It is clear that taxes on income and profits (38 per cent of all taxes) and taxes on international trade (40 per cent) are the most important sources of revenue. Domestic taxes on goods and services are also significant with one-fifth (21 per cent) of total taxes coming from this sector. Taxes on property are very low, comprising only 1 per cent of total tax revenue. 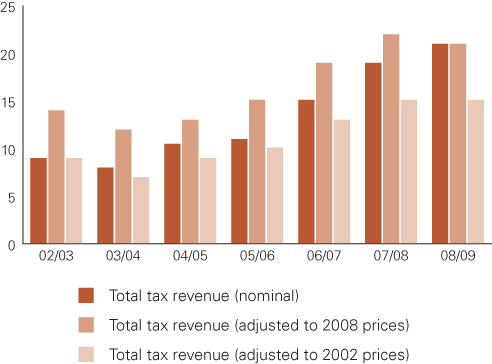 In Figure 2 the total figures for 2002/03–2008/09 are used to provide an overview of the growth in revenues. For illustrative purposes we have included both real and nominal figures to show the marked differences when adjusted for inflation. In Figure 2 we have used two inflation indexes. The first uses 2008 as the index year and the second uses 2002 as the index year. While Namibia is a country with fairly limited inflation, some countries experience much higher, sustained inflation. In all cases, it is crucial to adjust for inflation. In Figure 3 we develop the idea illustrated in Figure 1 and show how the composition of different types of tax has evolved over time. This not only allows us to compare the level of contributions from each of the major sources of revenue for the Namibian government but also adds the element of evolution over time. Here, percentage of total revenue must be used. It shows that the share of tax revenues deriving from taxes on income and profits has been declining somewhat until 2007/08. 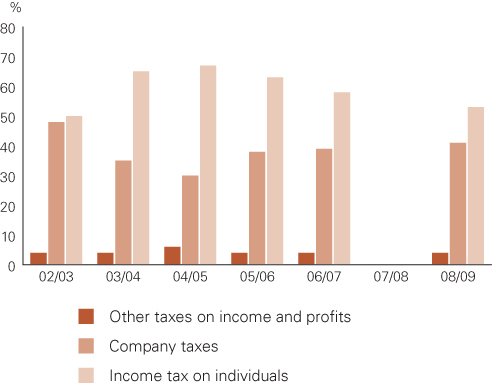 In 2008/09 this trend was broken and this tax provided a bigger share of total revenues. 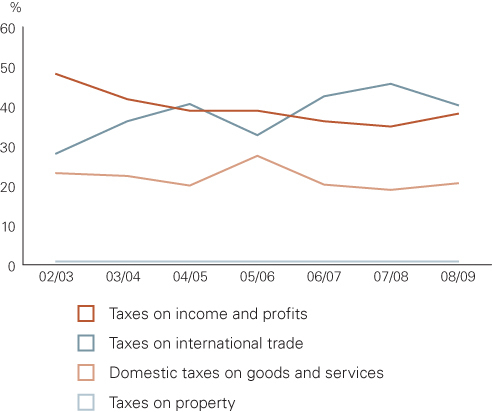 The share provided by taxes on international trade has fluctuated greatly. A substantial drop in 2005/06 was matched by an increase in domestic taxes on goods and services. 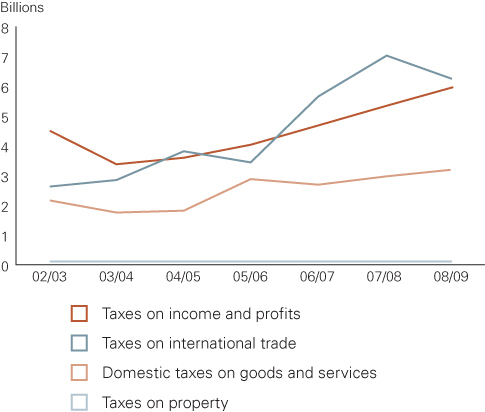 Between 2002 and 2008, Namibia experienced a significant growth in revenues from taxes on income and profits. The share of revenues from taxes on income and profits in Namibia declined in the period from 2003 to 2007. A number of other observations can be made based on the figures above. For example it can be noted that taxes on international trade registered a significant drop between 2004/05 and 2005/06 as well as between 2007/08 and 2008/09. The volatility of this tax must be a concern for the Namibian government, as a very significant share of revenues comes from this source. Domestic taxes on goods and services have registered a growth in absolute terms, but as a percentage of total tax revenue the share has been stagnant except from the outlier in 2005/06. Your research question may be to find out whether the citizens of a country bear a greater tax burden than the corporate sector. In the case of Namibia, Figure 5 shows that since 2002/03 the government has collected significantly more taxes from individuals than from companies. On the basis of Figure 5, it can be concluded that in 2002/03 companies and individuals contributed almost the same share of revenue. This changed dramatically in the following year when individuals suddenly paid two-thirds of the income taxes and companies only paid one-third. This tendency became even more pronounced in 2004/05. After that, the share of taxes from companies started growing but in 2008/09 individuals still contributed almost 60 per cent of income taxes and companies only 40 per cent. Figure 5 shows that data for 2007/08 was missing. This leaves a gap in the information and as a result this year has been left blank in the figure. We are still able to generate a fair overview of the trend but if more years had been missing this would obviously become difficult. Where data is missing, it is important to declare this. Often it will be simple mistakes that caused information not to be disclosed and this can be corrected if addressed by civil society organisations. In cases where the lack of information is systematic, the starting point is to push for transparency as a first step towards more accountability. This kind of analysis can be replicated for any country for which data is available. It can also be extended with projections for the future. This can show what the expectations are and reflect different types of policy choices. If your research question involves looking at the impact of taxation on a small number of poor people, the ‘poor person’s tax burden’ will give you a snapshot of how much a number of individuals, or even an entire community, is paying in taxes. The questions you ask should be tailored in relation to the relevant kinds of taxes. You can also compare this to the amount spent on government services obtained by this same group.A sample survey is included in Appendix 2. The survey has been developed in a way that takes the specific cultural, ethnic and linguistic characteristics into account.You should also be aware of ethical concerns. Some people will feel uncomfortable revealing information about private issues such as their income, asset ownership and spending patterns even if they are granted confidentiality. You should still code the participants with letters to allow accurate follow-up. For all research projects, participants should provide you with free, prior and informed consent to take part in the project. This concept means that participants should explicitly say that it is OK to involve them in the research (consent), before the research takes place (prior), while being told what the positive and negative consequences might be (informed), without any force being applied to coerce them (free). Before beginning the research process, it is important to set in place plans for validation. This ensures accountability for the researcher and enables a range of perspectives on the work. are scrutinised by two colleagues who act anonymously in conjunction with the editor. In CSO literature, an open peer review process is more common. This means that a reference group can discuss the findings as a group, and decide collectively on how to proceed with publication. It is important to have your reference group of experts in place at the start and to agree a time when they will receive a draft report for commenting. In some cases, it may be appropriate to include advocacy targets in the reference group, as this way they may identify weaknesses in the research more easily. Involving them in the process at an early stage will mean that they are more likely to feel ownership and less likely to criticise the research when it is published. If the report is to be agreed by a coalition, it may be worth building in time for a seminar where the researcher presents the findings for discussion by the coalition. This can help to build ownership and avoid problems at the sign-off stage. Involving advocacy targets here can also assist this process. and are more likely to support other advocacy efforts that may cite their community (not the individuals) in a report that you publish. Write a snappy, hard-hitting press release and make calls to journalists who may be interested in your story. You could offer the story exclusively to one journalist if there’s a chance of better coverage. You could approach a well-known or influential person who might be able to place an opinion piece in a newspaper. Organising a public debate or event can be a successful way of gaining media attention. You could invite speakers from the local community, experts, politicians and, of course, journalists. Launching your report is only the beginning. It’s important to continue to refer to it in any dealings you have with your advocacy targets. It’s often helpful to do a follow-up report, six months or a year on, as a kind of report card. Have things changed? With this in mind, you should always write an executive summary of no more than one page before going into the detail. The highlights of your report could also be adapted into briefing papers for different audiences. Facts give your report rigour and authority. Quotes and stories from your first-hand accounts give a sense of urgency to your report and bring it to life. Photos or illustrations that match the location, theme or company in question can help to contextualise what you are saying. In Chapter 2 we discussed how research fits into the advocacy cycle. Having invested resources into producing research, this needs to inform your advocacy strategy and support it. Considering how you will follow up with advocacy and campaigning actions is best done at an early stage.